He led the chorus on Russian collusion with the Trump campaign, and now top Republicans want Adam Schiff to say dosvedanya. House Minority Leader Kevin McCarthy, Trump adviser Kellyanne Conway and numerous GOP lawmakers are calling on the California Democrat to resign as chairman of the House Intelligence Committee for having claimed there was "more than circumstantial" evidence that Donald Trump's presidential campaign conspired with the Kremlin in an effort to win the 2016 presidential election. "Now we find out that none of that is true," McCarthy, R-Calif., told The Associated Press after Trump's Attorney General reported that Special Counsel Robert Mueller found no proof of conspiracy. "He should first apologize to the American public and he should step back from the chairmanship." Mike Turner, a Republican congressman who serves on the intelligence committee with Schiff, called for him to step down because he's been "divisive." "He's been dishonest with the American public on what was happening, blaming the Republicans" for stifling the congressional probe into Russia's election meddling, Turner said CNN on Tuesday. Conway said earlier this week that Schiff should resign from Congress altogether, a call she doubled down on on Tuesday. "Are we supposed to have faith in his ability to be a nonpartisan arbiter of what is right? This is somebody who has access to the nation's secrets," she told Fox News. Schiff has long been one of the loudest Democratic voices on the issue of Russian interference, repeatedly suggesting more incriminating information would emerge from the investigations into the Trump campaign. "I can tell you that the case is more than that and I can't go into the particulars, but there ismore than circumstantial evidence now," he told Chuck Todd on MSNBC's "Meet the Press Daily" in March of 2017. He's also said the Russia case is "a size and scopeprobably beyond Watergate." According to a summary of Mueller's long-awaited findings by Attorney General William Barr, there was no coordination or conspiracy between Trump, his campaign and the Russian government. That's despite numerous interactions between the Trump campaign and Russian nationals that had not been disclosed publicly until after the election. Schiff stood behind his comments, and said he's not going anywhere. "I'm used to attacks from the president and his allies. This is really nothing new," he said leaving a House Democratic caucus meeting on Tuesday. He also vowed to press ahead with his committee's investigations, and to push for a public release of Mueller's report. 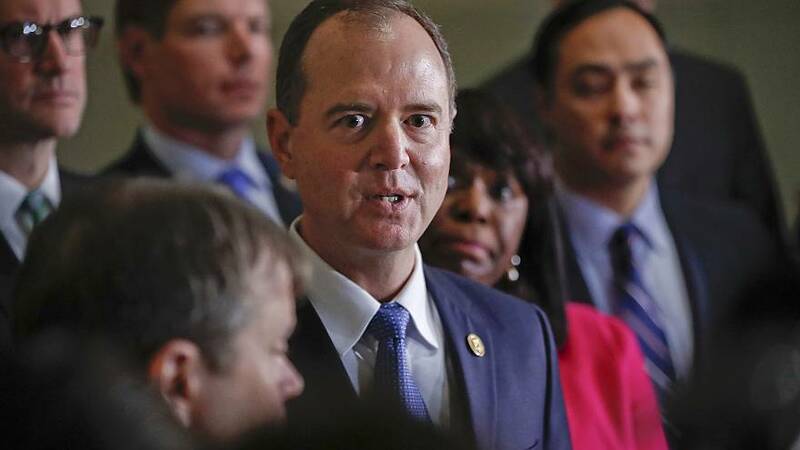 "The American people need to see the whole report, and we'll be discussing with leadership if necessary what steps are gonna be required to make that happen," Schiff told NBC News. On Monday, he told the Associated Press that while there was evidence of collusion iin "plain sight," he accepted Mueller's conclusion that he could not prove a criminal conspiracy beyond a reasonable doubt. Of the GOP attacks - which included a call from the Trump campaign that he be kept off television — he said, "I take it as a sign of effectiveness that they feel the need to go after me." Rep. Pete King, a Republican from New York, said Schiff should "put up or shut up." "I got along with Adam for a number of years, but in the last 2 years he has gone off the rails. If there's evidence that Adam has, he needs to come forward," King said, but "if Mueller couldn't find anything, I don't know where Adam Schiff is going to find it." House Speaker Nancy Pelosi, D-Calif., has said the Republican calls for Schiff to step aside are "absolutely so ridiculous."